Winter 2014 Reveal Day 2 - New SN@P! Howdy friends, Layle back with you again today for Day 2 of our Winter 2014 Reveal Week! If you missed us yesterday, you can catch the reveal of DIY™ - Design It Yourself here. Today brings an assortment of new SN@P! products, sure to please! In fact, these are some of my favorite & most useful products we're releasing; products that I know you've been anticipating, based on the comments from the sneak peek on Friday. Hold on to your hats today my friends, you're in for a wild ride! Yesterday you saw the new burlap stickers and today brings you more burlap, in the form of Burlap SN@P! Albums in teal, red and black!! If you're not familar with our original core SN@P! Albums, we released them a few years ago and they've been a staple among scrapbookers and crafters ever since. The popular 6x8 size in 7 colors, complete with 10 Pocket Pages, journal pages and chipboard dividers has been one of our most popular Simple Stories products, so it only made sense to introduce the latest and greatest SN@P! Binders, now in burlap! DIY™ - Design It Yourself. Howdy friends, it's Layle back with you today! The bold pattern and colors coordinate perfectly with DIY™ - Design It Yourself from yesterday! Of course, the new burlap albums include your standard inserts like 6x8 Pocket Pages, Journal Pages and Chipboard Dividers, even better - we've also mixed it up a bit by including new die cut pages and a Kraft envelope! Do you Instagram?! We do! If you're not following us, now's a good time to start! You can follow us at simplestories_ for behind the scenes photos I'll be sharing as we prepare for the Craft and Hobby Association Mega Show later this week where we'll showcase all of our new products to retailers. We also have some giveaways going on over there too. Speaking of Instagram, did you know research shows there are more than 100 MILLION active Instagram users? If you're one of them, you're most likely familar with, and scrapping, square photos. And that my friends brings me to our next new SN@P! product - 6x8 Insta Pocket Pages in 5 designs, perfect for your Instagram photos! It's hip to be square with our new Insta Pocket Pages! And hey, did you know that our existing, as well as these new 6x8 Pocket Pages also fit perfectly in our 12x12 albums? You can catch a quick video on that here! Now that we have these handy, dandy new Insta Pocket Pages to accomodate your 2x2, 3x3 and 4x4 square photos, how about a new TOOL to help you quickly & easily crop your photos to those fun insta sizes? Next up - you're gonna flip over our new Photo Flips!! Photo Flips enable you to quickly and easily add additional photos and/or cards to your Life Documented/Pocket Page spreads. Simply insert a photo or card in the pocket, remove the adhesive strip and adhere to the top of your 6x8 or 12x12 Pocket Pages. Available in 3 popular sizes - 3x4, 4x4 and 4x6 - you'll FLIP over our new Photo Flips! Speaking of photos, how about these new Clear Photo Stickers? Jazz up your photos with our new Clear Photo Stickers, available in black and white! Last up for today is more photo goodness with our new 3x4 and 4x6 Photo Overlays! Simply add the transparent, printed overlay to the top of your 3x4 or 4x6 photo for that little extra something something! PHEW! That is quite a bit of new SN@P! goodness, if I do say so myself! The new SN@P! products begin shipping to retailers mid March. I know I'm counting down the days, how about you? How about a chance to win a new SN@P! prize pack before you can buy it?!! You have 2 chances to win! Second - PIN TO WIN! Just pin your favorite of the new SN@P! images in this post, tag your pin with simplestories and New SN@P!, then leave us a comment on this blog post telling us that we've been pinned and include your Pinterest user name. That's 2 chances to win a new SN@P! goodie box before you can buy it! And because I'm feeling extra generous, how about a 3rd chance?! Remember when I suggested you follow us on Instagram in the middle of this post? I'll be doing random giveaways on Instagram as well throughout the week, so follow us on Instagram at simplestories_ for a 3rd chance to win! Good luck - we can't wait to hear what you think about our new SN@P! products! And remember, today is only Day 2 of SIX, so meet me back here tomorrow morning for Day 3! So much goodness!!! Love Simple Stories!!! wow I love this collection!!! love the SNAP and I'm thrilled to see all the new products! I love the clear photo stickers and Insta pockets. I look forward to seeing all the new Simple Stories goodies in my local scrapbook store. Amazingggggggg!!!! I love all the new things! Love these albums, and the new plastics. Allready made space for all the new embelies that are coming out. Love the new clear photo stickers!! LOVING EVERYTHING I see from DIY!!! My favourite and most exciting elements from today are Photo Crop, Photo Flip and Photo Overlays - WOW!!! AND for the chance to win some CRAFTY AWESOMENESS!!! I cant wait to try the photo crops and flips! Hi I pinned at connietacazon username. Thanks! Just pinned my favorite photos!!!! This new stuff is amazing. I had to pin the chevron binders. Beth Lemon. So glad you have Instagram! Omg I loveeee your new items I have to have them. I really like the new 6x8 page protectors. I talk about your products in my youtube videos all the time. It is a goal of mines to be on your design team one day. Love the new products! The albums are so sweet! Thanks for the chance! This is the answer to my search for my little girl! 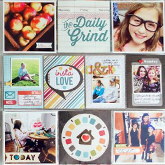 She loves to scrapbook but 12x12 is too hard for her (she is only 8) This SNAP looks perfect - fun, easy, instant results and it looks so good!!!!! So love the burlap albums and the convenience of being able to scrap even the smallest photos, these are my vacation albums this year for sure! totally LOVE the look of the new clear stickers and overlays :) My pinterest username is Agnus Kasprzak and I've pinned here http://www.pinterest.com/aga04/project-life/ can't wait for these goodies to hit the stores! Clear photo stickers and overlays-yes! Love them to bits! And still dreaming of the DYI collection. I love seeing the new releases, CHA is always so exciting. Love, love, love the photo flips and new albums! Pinned some more great stuff...username Heather LaBond. The Photo Crops are very cool! I just got my first SN@P album for Christmas and I love it! I have never used pocket pages before but now I am scrapping faster than ever. Genius! Definitely picking up the photo overlays! I can't wait to get my hands on those overlays! LOVE the new lines....the Photo Flips!! OMG perfect!! I love it! I'm so excited for new configurations of the Pocket Pages!!! I HEART the clear overlays and photo stickers!! Now THIS is a release I've been waiting for! And product! I'm glad there are NEW page protector styles for the 6x8 album! It really opens up the possibility for creativity!! I can't wait to stock my collection with these products! I think DIY is going to break my moratorium on purchasing supplies! quick question: how many pages are in the flips? Love, LOVE ALL of these new products! So interested in those photo size croppers. I had to have the last batch of clear stickers so definitely wanting these as well as those overlays. And the photo flips are pretty cool as well. OH MY GOSH! I am so excited! I can't wait til its available for purchase. Liked, commented, pinned....LOVING ALL of this.....I may be in so much trouble! I'm liking the new 2 x 2 size and burlap albums. So much to be excited about in this post! I love the overlays, the 2x2 openings, and the clear stickers, too!! Eeek! Pinned some of my favorite images! I love all of these products!! I can't wait to get the new album and all of the fun goodies!! Love the burlap albums!! Must have for sure!! Thanks for the chance! I'm SO bummed!!! I thought those burlap albums were going to be 12x12 binders! I was so excited about them. Maybe you could consider this for us traditional 12x12 scrappers in the future? I do love the clear stickers! OH LOVE the photo overlays love them so much! and the clear photo stickers are perfect too ..
With these cool overlays, I feel like I actually have a chance to FINISH an album!!! Love it all! I especially love the photo stickers! Love all of it!!!! Insta pages, burlap albums! Too much goodness!!! I really like the clear stickers but am a little uncertain about how to accomplish the rest , since I have never done it before and will have to experiment before I do any major project. Thanks for introducing it to me. Hope I win then I can really experiment. Wow - loving everything! The burlap albums are DARLING...and I love the new photo flips and cutting templates - genius! Fun! Loving the photo overlays and clear stickers!! I LOVE all the new products! Gorgeous! Would love to win a Sn@p binder or two! OMG! So much new and amazing goodness!!! Love it. Man oh man...LOVE those new burlap binders. I bet they are even more amazing in person once you can truly see and feel the texture! Thank you for the chance to win! Really excite about the new sizes of page protectors! Those instagram pockets will be perfect love them as the clear stickers for the photos. I love it all...but the clear photo stickers really have me swooning!! I am SOO SOOO SOOO in love with the flips! MUST HAVE IT! Ooh can't believe this is only day two! I simply love it all! I love the new page options for the 6x8 albums and all of the new products!! OOOOOHHHHH wow, this is awesome, love it! This is great, what a lot of inspiration! GO ON! oh man - those new clear stickers are amazing! I want them all :-D !! I do not think there is anything you do that I do not like, but this collection is going to be top on my list!!!! The clear photo stickers are awesome! Actually,I love all the new products,they will be so helpful in making pocket pages! OMG so excited to see all the new products! Love that you are making pocket pages even easier and more fun to do! LOVE, LOVE those photo crops - total awesomeness, right there! Yessirree!! LOVE the square pocket pages! Love the Blue Burlap Binders! Love the photo flips!! The great items just keep coming & coming! I love that photo crops tool! It's so simple yet ingenious at the same time. I love the sleeves with instagram pockets as well! Here's one of them: http://www.pinterest.com/pin/225531893813215515/ So excited about the chevron albums and the Insta... pages! Love, love, love the square shape of the new insta pockets! Love the new pages can not wait to play with the new size! I am super excited for the photo flips!! Love it all! Sn@p is awesome! Love everything!! those chevron albums are awesome. also love the photo flips. I love the photo phrases - a wonderful idea! I love everything! I don't instagram because I do not have a smart phone. But..I do love the instagram size photos. And also love creating with this size of photos. My Selphy lets you collage on a 4x6 and it works perfect for me to get the size I need..But how cool that the templates you have will let me do this also! Love Love Love!